From the muddy banks of the Dee....: A new obsession! I do rather enjoy finding birds, usually waders, with colour rings on their legs. I like the challenge of finding the ringed bird in a huge moving flock, then following it long enough to get the full colour code. I enjoy sending the details off to fellow enthusiasts and knowing that in a small way I am contributing to the research projects on, and ultilmately the conservation of, these birds. I've seen plenty of colour ringed Black-tailed Godwits (more than 20 this calendar year) and several Knot. I've also seen ringed Redshank, Purple Sandpiper and Turnstone. Sanderling still elude me! Today I fancied a go at finding a colour ringed Redshank. Numbers are building up on the Dee and I think I can get close to nearly 1,000 of the rascals on Thurstaston Shore. I get the the botton of the steps to the beach and set up the scope. Plenty of Redshanks. Cool. There are 3 Little Egret wading about the channel. Suddenly another 14 drop in from nowhere. I decide to have a look at them, mainly because they amaze me by staying pristine while feeding in such a muddy environment. Something catches my eye. No, surely not! A coloured ring! Red. What about the other leg, yes, a green one. Both on the tibia, but I'm not close enough to see if there is anything inscribed on either. 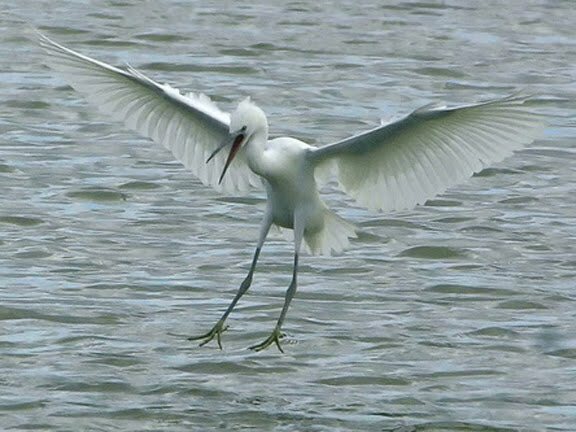 This is the first time I've seen a colour ringed Egret anywhere, in fact I wasn't aware there were any projects ringing Little Egrets. I try and get closer but I still don't see any letters on the rings. Soon the group moves on up towards the Dee Sailing Club and I'm left with just the colours. I'm not sure there would be letters on the rings, but they were large enough to have them and I know some projects do include them. And so starts a new obsession. Now it's not just the waders I have to study for rings, I'll be checking anything that moves/flies! I return to the Redshanks as I'm really in the colour ring mood now. I go through nearly 1,000 but don't spot any rings. 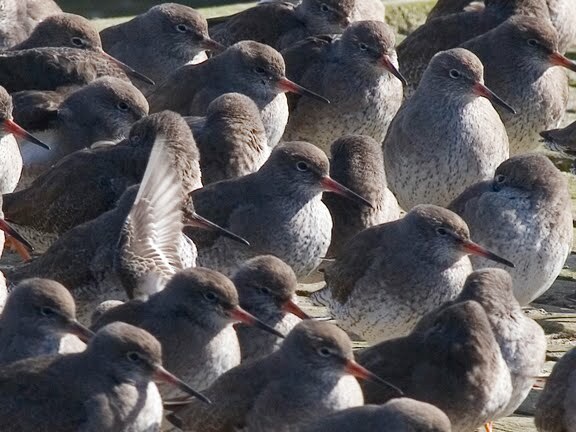 I do find an elegant Spotted Redshank amongst the throng. It's an adult in non-breeding plumage, roosting on the edge of the channel.